Michael Needham, 4, admires his handiwork, viz. 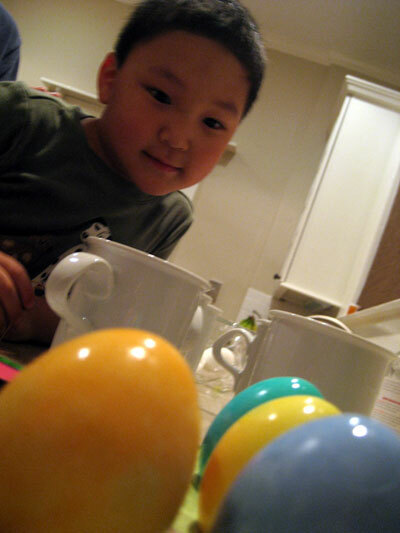 his freshly dyed Easter eggs, while others soak in their coffee mug vats. For those looking for other ways to enjoy this relaxing Saturday in Birmingham, AL, you’ve still got time to get to Ensley for their 3rd annual Easter Parade and Gospel Concert. The parade starts at 12 p.m. and the concert begins shortly afterward. Need some other idea (or have some you’d like to share)? Head on over to this week’s got plans post over on Timetable. BTW, if you feel so compelled to share your photos from this weekend, send them into photos@bhamterminal.com. Photo: Rob Needham. Email submission to bhamterminal. This is the event’s second year, and to celebrate, there’s a longer parade route! This year’s parade will begin at Jackson-Olin High School. It will proceed down Avenue to 19th Street, Ensley where it will turn right. It will then follow 19th to Avenue D, where the gospel concert will begin at 12:30 p.m. It’s a great chance to head on over to Birmingham’s West Side and check out what’s going on. For more information, including a list of gospel choirs performing and sponsors, visit Main Street Birmingham’s events calendar.